have their debut album "In The City"released on Polydor in the UK today. It's an even dozen tracks, ten of which are compositions by lead singer/guitarist Paul Weller. The only two covers are Larry Williams 1950s classic "Slow Down," and the theme from "Batman." written by Neal Hefti. 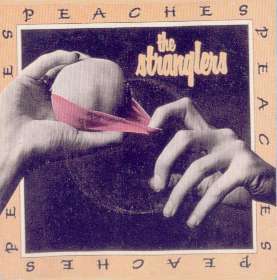 Other tracks reflect the band's view on being British in 1977. They're very much against apathy. The album was recorded in only eleven days at Polydor's Stratford Place studios. Tracks include "Art School," "Away From The Numbers," "Sounds From The Street," "Taking My Love," and the title track "In The City." For a full review click the sleeve. are grinning ear to ear. Their debut album as been selling faster than they ever could have imagined and is now the fourth best selling album in the United Kingdom. That puts the band in the company of Abba with "Arrival," "The Shadows 20 Golden Greats" and "Hotel California" by the Eagles. A position like that reflects over 30,000 albums have been sold in about three weeks. That's the level of success that boring old farts like Led Zeppelin and Elton John aspire to. The album's impetus will be aided by issuing a new single today, "Peaches" b/w "Go Buddy Go." The flipside was one of the many songs left over from the prolific album sessions in January and not included on the LP. For a full review click sleeve. THE BOOMTOWN RATS from Dublin, Eire play their first English gig at Studio 51, for a select crowd of Phonogram Records employees. They've just signed the band after a battle with five other labels. The band was very particular about their deal, taking greater care in selecting a record company than most other bands. Tonight is the first night they begin their assault on England. "We are in this to get rich, to get famous and to get laid." 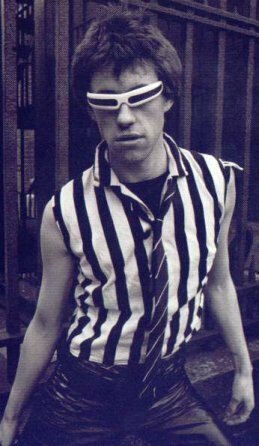 Bob Geldof (Boomtown Rats) 1977. The band minus Sid are busy in the studio laying down tracks including guitar overdubs on 'New York'. ADAM AND THE ANTS in search of management audition for Andy Czsezowski at Scarf Studios London. 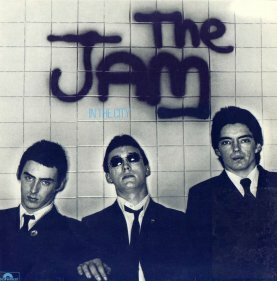 The Jam, Buzzcocks, Subway Sect play Aberdeen University tonight.